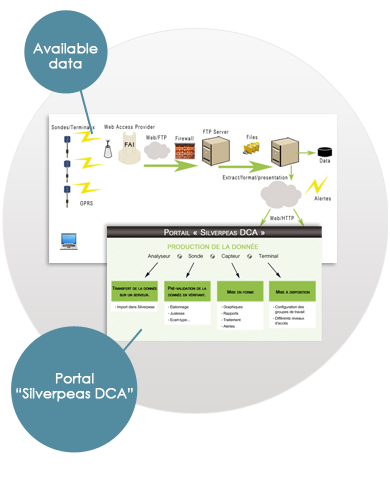 DCA is a turnkey system to gather, control, monitor, and aggregate datas. Data are sent via a web connection (mobile terminal, GPRS or wired connection) and are received via the protocol FTP. Flow of datas can be sent as XML or. Csv format. Organizational structure of collection points (such as a network of collection points). In the Graphic User Interface, it is possible to select data, then create charts and graphs upon time slots. It is also possible to attach documents (photos, scans ...) and to attach them in areas of measurement. These documents contain metadata (records) and the publisher may choose to make them available for specific people, groups or evrybody (people who can access to the portal). The portal has a search engine to find the proper documents (by keyword or topic). Connection to the service DCA uses secure mode (https) via a web browser after authentication (username and password). Datas can be prompted via the Web GUI of DCA. Ergonomy is intuitive. Datas are stored in a SQL database that can be encrypted. Old datas can be automatically archived. Datas can be checked by the "Data Warning" ® service, that schedules checking at regular intervals (every minute, every hour, every day ...). If abnormal values are detected, users are notified via various channels : sms e-mail, etc).